Not only is repurposing old materials extremely eco-friendly, it’s easy on your wallet. It may take a bit of extra elbow grease, but the end result is undoubtedly worth it. If you need help finding wood to repurpose, head to your local lumber yard or hardware store to look for scraps, which are usually set at a low price. Otherwise, utilize materials you no longer need—think old fence posts or scraps from a past project. You can also find reclaimed wood on local buy/sell/trade websites for cheap (or even free) or by asking local businesses if they have any used pallets they’re looking to part with. From there, you’ll need to put your handyman skills to work. If you don’t have any, find a simple reclaimed wood tutorial to start with, and don’t be afraid to ask for help. Your local lumber store is a great resource. You’re sure to find the perfect project for you in this roundup of impressive repurposed wood tutorials. When it comes to decor pieces, accent mirrors are the perfect combination of functional and chic. If you have a small amount of reclaimed wood, you can use this tutorial to kick yours up a notch. You’ll learn how to make any cheap mirror look like a million bucks. This wooden caddy project is extremely versatile. Once you get it down, you can make it over and over again to satisfy multiple purposes around your house. Its distressed wooden look will have your home looking like a rustic farmhouse in no time. The word “bookshelf” seems to limit itself. In fact, bookshelves can be made for a number of things, not just books. Use it to store pantry essentials, travel souvenirs, photo frames, and more. Grab some reclaimed wood and a few power tools and get to work building your own impressive furniture. This detailed tutorial even comes with a free printable—talk about easy-to-follow! These fun wooden window boxes will cover up the tops of window blinds while adding a pop of style to your space. Headboards instantly pull a bedroom together, but they can get quite expensive. Making your own is a wonderful solution. Exposed brick makes any space look hip and modern. Unfortunately, it’s not always an option. Fortunately, you can make this tutorial using reclaimed wood to make faux-brick wall art. It will take some forethought and planning, but you’ll end up with a timeless piece perfect for hanging wreaths and displaying anywhere in your home. Bonfires under the stars, outdoor barbecues, lounging on the patio—sign us up! Summertime is always on our minds. All great outdoor gatherings involve cool refreshments. Camping coolers don’t always look glamorous, but this DIY project using reclaimed wood to build a classy deck cooler is here to save the day. Your summertime guests will be so impressed with your handiwork. Looking for trendy yet budget-friendly decorations? This is your craft. Simple and easy-to-find materials like coffee stirrers and wire are used in combination with a reclaimed wood block and a bottle lamp kit, which you can find at your local craft retailer, to make a one-of-a-kind lamp. It’s always disappointing to see a fireplace without a built-in mantel. Mantels are perfect for displaying artwork, knick-knacks, and photos in style. Plus, they’re essential for hanging stockings during the holidays. If your fireplace doesn’t have a mantel, make your own out of wood. It’s easier than you think! Mountains always look good. This simple mountain wall art will remind you of how majestic they are wherever you place it. It makes a great housewarming gift and looks lovely in nurseries, bedrooms, and even bathrooms. Yes, displaying decorative plates is a thing. But that’s not all this cute DIY ledge shelf can do. Make this reclaimed wood shelf to store magazines, display photos, or whatever your heart desires. It’s versatile, inexpensive, and—best of all—simple. No matter where you work, keeping things organized is key. This DIY memo board will definitely help you with those organization efforts. The idea of building your own shelves can sound intimidating to those of us who aren’t expert woodworkers. Well, we’re here to show you that it isn’t as daunting as it seems. This small DIY wooden shelf is the perfect project for beginner woodworkers to get the hang of things before moving on to bigger and better things. We understand that entertaining is a form of art, which is why we included this DIY tray tutorial in our roundup. Using reclaimed wood and other used materials, this craft is extremely budget-friendly. These trays are excellent host and hostess gifts and will look amazing when serving drinks or appetizers at your next party. “Free” is the key word here. 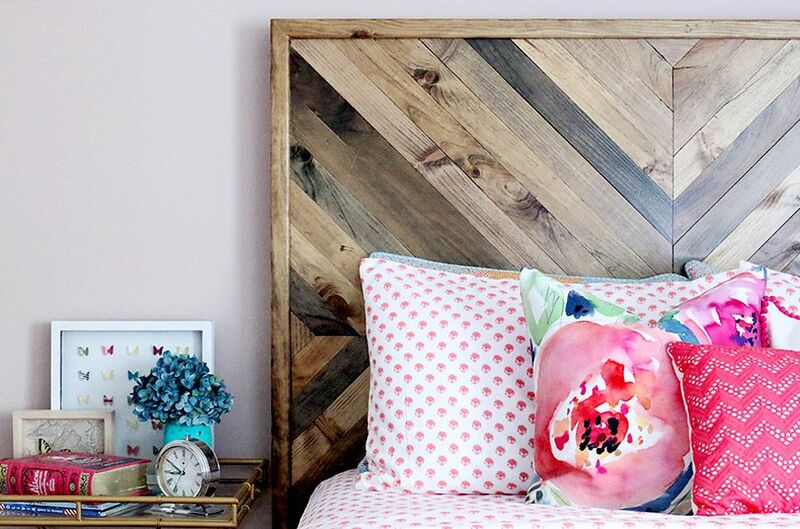 This adorable DIY reclaimed wood wall didn’t cost this blogger a penny. Can you do it, too? Once you start making these handy bottle openers, family members and friends won’t stop pestering you to make one for them. Lucky for you, this project is simple and relatively cheap once you have the supplies. Using wood to house flowers and other plants looks natural and will give your outdoor space a sense of tranquility.